Maybe you're responsible for a long, complex project and you have never used this program before. What now? Follow the links in this document for detailed information about the advantages of using Project over other programs, and then start to use it to perform basic project management tasks. You can also learn how to get more help from other Project users who have been in the same boat. The best way to learn about Microsoft Project is to start to use it to perform basic project management tasks. The following links provide instructions and videos that will help move you in the right direction. Need a refresher on basic project management tasks before you start? Read Getting started: Introduction to project management. Microsoft Project provides tools for managing complexity in projects that are more than a simple series of tasks. See all the videos, tutorials, and other ways to help you get working right away with Project 2010. A little methodology never hurt anyone. Learn the fundamentals of project management to help you get the most out of Project 2010. When you're ready to begin to use Project 2010 to manage your project, you will have to add and link tasks, create calendars, and decide how to schedule resources and tasks. Follow these links to get started. This overview walks you through the big picture of setting up a project with Project 2010. New features such as manually scheduled tasks, inactive tasks, and top-down scheduling put more control in your hands. Experienced project managers and Microsoft Project users can be the most useful resource for a new project manager. There are many methods of joining the community and finding answers to your questions. Tap the collective wisdom of other Microsoft Project users by posing questions in discussion groups, reading Project blogs, joining project management Facebook groups, following Twitter feeds, or using any of the other community resources mentioned in this article. 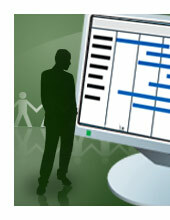 Can provide answers to your questions about Microsoft Project and project management. The Project Help team tweets announcements about new and updated content. Offers opinions and insights from Microsoft program managers on what Microsoft Project is and where it is going.